Today, the sports world witnessed a sad event. The legendary professional quarterback Peyton Manning has parted ways with his team of 14 years, the Indianapolis Colts. I’m not even a Colts fan and I’m saddened by this. I have watched Peyton Manning play football for years and really did enjoy watching him. He is a classy man and a classy athlete. You never saw his name in the tabloids, he stayed out of trouble, seems to be a real family man, and he truly knew how to lead his team. Peyton came to Indy in 1998 as the first overall pick in the draft, and has been a Colt ever since. 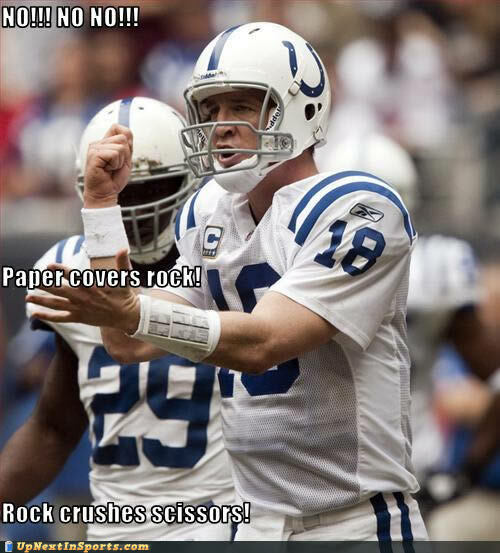 But perhaps my favourite thing about Peyton is his passion for the game of football and his intelligence on the field. He knew how to call a play, and which one to call at the right time. He knew when to pass and when to rush. He knew who to pass to, and he had his favourite receivers. A better question would be what didn’t he know? His stats say it all. Career 64.9% pass completion rate. That’s 4,682 completions for 7,210 attempts, for a total of nearly 55,000 yards. It was hard to watch the Colts this season. Everyone was so used to them winning that seeing them lose–sometimes embarrassingly–was disappointing and disheartening. I really did feel bad for the entire team, but that is what happens when the team is heavily dependent on one person. And now that Peyton is going the free-agent route, the team will be spending the next few years rebuilding the powerful team Peyton built in his 14-year tenure in Indy. I also know the Colts didn’t want to pay him $28 million or however much just to see if he could still play and perform well, but there has to be another approach. Maybe pay him a portion of the money and see how he does, and if he performs well, let him stay, keep playing, and pay the rest; if he doesn’t play well, then bring him to the business/administrative side of the team. I don’t know how likely that would be, but it’s a thought. Regardless, the decision has been made, and it’s not going to be changed. Peyton laid a great foundation in Indy, and will always be a hero there. And he’s going to make some other team really happy next season. Best of luck to you, Peyton. We’ll miss seeing you in the blue and white 18 jersey, but you will always remain in the football world, whether you’re on the field or calling plays from the sidelines. Sunday Social + Awesome Weekend! #TBT Thursday Nights in Lane are BACK!